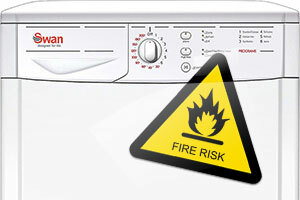 Whirlpool has added 58,000 Proline and Swan tumble dryers to the list of fire-risk machines, just three months after it issued a fire warning about some of its Creda, Hotpoint and Indesit tumble dryers. The 58,000 affected models are in addition to the 5.3 million Hotpoint, Indesit and Creda dryers already identified as being at risk. Whirlpool has not released the model numbers of the fire-risk machines. Instead, it advises consumers to check whether they own an affected model via the website safety.hotpoint.eu or by calling 0800 151 0905. But our extensive research has uncovered a list of models we know are affected – read ‘What to do if you own a Swan or Proline tumble dryer’ below to see if your dryer is on this list. Considering replacing your tumble dryer? Check our tumble dryer reviews for the ones we recommend. We can reveal that 77%, or 14 of the 18 Proline and Swan model-lines made between 2004 and 2014, are a fire risk. Swan – STC407B, STC407W, STCL407B, STCL407W, STCL408B, STCL408W, STV407W, STV408B, STV408W, STVL407B and the STVL407W. If you own one of these tumble dryers you should stop using it. If your machine’s model number isn’t listed above you should still check whether it’s affected by visiting safety.hotpoint.eu. In 2015, Whirlpool revealed there was a fault with some dryers across its Hotpoint, Indesit and Creda labels. The company said that more than one hundred different dryer models – potentially millions of machines in total – could catch fire if fluff comes into contact with the heating element. Whirlpool branded dryers are not affected. Since news of the fire risk broke, it’s been revealed that at least 113 Hotpoint, Indesit and Creda model-lines are affected. This week’s news that Proline and Swan models are also part of the safety alert brings the total number of affected dryer-lines to 127. See how this issue affects other brands – read our story on fire-risk Creda, Indesit and Hotpoint tumble dryers. We think more needs to be done to inform owners if their dryers are potentially dangerous. This should start with Whirlpool publishing a full list of affected models from all five brands so that more consumers can find out if their dryer is at risk. If you own a dryer affected by the safety alert, our advice is to not use it until it’s been serviced and modified. Whirlpool told us it has contacted 3.4 million owners about the safety risk so far. It also told us that 1.2 million customers have registered for a free repair to date, and that 4,300 products are being repaired each day.